After a job and salary offer has been made, and it is acceptable to you, request it in writing. If there are problems in the future, and there is nothing in writing, you will be at a major disadvantage. Moreover, it is not uncommon for the hiring manager making promises to leave the company and be unavailable to vouch for you. Two common forms of written agreements include employment contracts and letters of acceptances. If you are not being hired as an executive or manager, a letter of agreement should serve effectively as an employment agreement. Request that the company hiring you draft the letter, and be sure to read and sign it. It is a good idea to have an employment lawyer review a letter of agreement to ensure your rights are not violated and you will be protected if future problems arise. Details about salary, benefits, vacation time, paid days off, and other important employment details. A section detailing how future problems will be resolved. Litigation and arbitration are two common ways to settle most employment disputes. You will be better protected if you can get your new employer to agree to solve possible future problems in court, instead of relying on arbitration. A list of your job responsibilities and the names or positions of those who supervise you. This is vital if you are hired in a supervisory or management role. Details about agreements deviating from the company's policies agreed to during salary negotiations. This could include any special privileges not enjoyed by other employees, such as additional paid vacation days or performance based bonuses. It is vital to get someone with authority to approve the specifics of your contract agreement to sign it -- either an executive, HR manager or division manager. This is more important if any of the points in the contract deviate from company policy. Those hired in supervisory or management positions should request the specifics of their employment agreement in a contract. 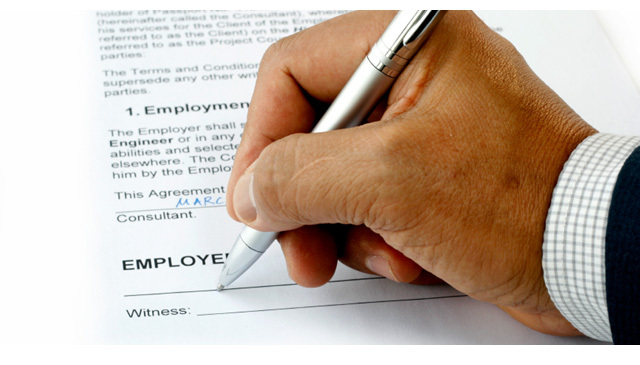 It is recommended to consult with an employment attorney to sign off on your agreement before signing it. Consulting an attorney can be expensive, but it could prevent future problems and save money in the long run.